Associate Professor Madhu Bhaskaran. Photo credit: Mark Dadswell. A team from Melbourne’s RMIT University has invented an award-winning product that could help detect harmful levels of UV radiation that cause melanoma. Skin cancer, as we know only too well, is the cause of too many preventable deaths. In fact, two out of three Australians will be diagnosed with skin cancer by the age of 70, and more than 750,000 of us are treated for non-melanoma skin cancers annually. But a research team from RMIT University have spent five years developing a world-first stretchable transparent skin – similar to a nicotine patch in size – to electronically monitor skin exposure to ultra-violet (UV) radiation. Getting the product to market may be just two years away, and it could cost less than a few dollars. Before commercialisation however, the team plan to make the product wireless and capable of transmitting data. The patch would be configured to pair with a mobile app to warn the user of excessive sun exposure in real time. While other UV sensors are under development around the world, there are two key differences that make this product game-changing. One, it can quantitatively collect data and two, it can flex and stretch – meaning it could be worn on the skin or integrated with clothing. It is washable and can also be made in a waterproof version, explains team leader on the product, Associate Professor Madhu Bhaskaran. “The ability to make oxides (usually brittle glass-like materials) stretch while retaining their performance makes this unique,” says Madhu. In the future, stretchable electronic skin may be used for other purposes, too: for instance, to create electronic contact lenses or to detect dangerous gases in mines. Madhu’s team have achieved a handful of recognitions for their work in the field of flexible electronics. She attributes part of their ongoing success to the culture of medtech innovation in Victoria. 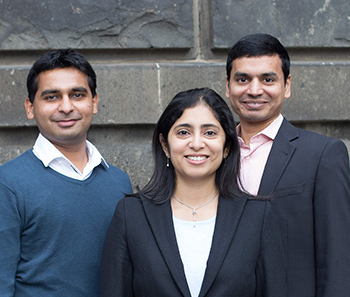 Madhu’s RMIT University team recently took out third prize in the Johnson & Johnson Innovation, JLABS ‘Victorian QuickFire Challenge: Driving Device Innovation’. Three winners will share in up to $300,000 of grant money and receive access to Johnson & Johnson Innovation's prestigious global mentoring and development resources. The competition offers healthcare entrepreneurs the chance to transform their research and early-stage innovations into the products that will advance the wellbeing of people globally. Johnson & Johnson Innovation runs QuickFire Challenges around the world and has chosen Victoria – with a headquarter at Monash University's Clayton campus – for its global reputation for innovation and excellence in medical technology and pharmaceuticals.